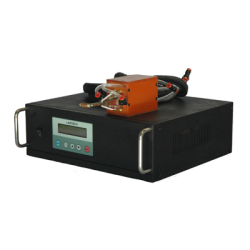 Transistor type high frequency induced heating machine is our latest high quality product. It replaces the former induction methods SCR or Vacuum tube oscillation, and adapt the latest MOSFET for oscillation. This heating machine can heat iron, steel, stanless steel, copper, brass, bronze, aluminum, gold, silver. It has been widely adapted in heat treatment, forging, brazing, and soldering industries. ·Manual / Automatic / Cycle control. ·Comparition with "tube induced heater"
oSave electricity up to 35%. oVolume and weight are reduced 100%. oConsumption parts are much cheaper.